InHouseCFO is the most qualified tech-savvy part time CFO for startups and small businesses (SMB) in Canada. Starting with a few Special Projects to test us out and get a feel for our responsiveness and financial, business and technology expertise, then moving to our best-value part time CFO Services, clients of InHouseCFO have by their side, all the experience, technical training, resources and enthusiasm that we at InHouseCFO have taken over 30 years to develop. Whether you are a startup or a growing small business, no matter what your needs are, we can work with you to determine the demands of your business in terms of time and complexity to confirm what we can do for you, and how we can help you generate better results faster. 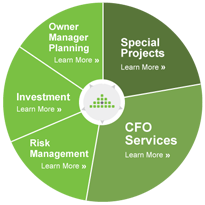 From there, again as your business grows and succeeds, you can draw on our expertise in dealing with risk management, investment, and longer term planning needs. You will experience better results faster.